A4 Mounted 7.3 x 10.7 in. MEDIUM 13.6 x 20 in. (346 x 508 mm) 18 x 24 in. Krishna Yamari (Tib. 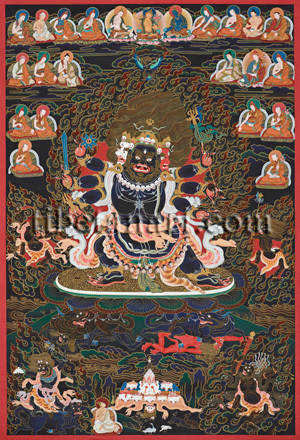 Shin-je she-Nag), or Black Yamari, is a wrathful emanation of Manjushri, who appears here in his three-faced, six-armed and four-legged form as the ‘Black Enemy of Death’ (shin-je she-nag). The meditational practices of this yidam deity belong to both the Nyingma and Drigung Kagyu traditions, with the Nyingma lineage descending from the terma or revealed treasure traditions of Nub Sanggye Yeshe, which was later transmitted and maintained as a special practice within the Drigung Kagyu tradition. Krishna Yamari is blue-black in colour with three ferocious faces, each of which has: three round red eyes, a gaping mouth with sharp teeth, bared fangs, a twisting red tongue, and tawny upward-blazing facial hair of eyebrows, mustache, goatee and beard. His central face is blue-black in colour with a pronounced beard and eyebrows, his right face is white, and his left face is red. Each of his three faces is adorned with a golden crown adorned with five jewel-topped dry white skulls, and he wears the golden ornaments of earrings, bracelets, armlets and anklets. His tawny-yellow hair streams upward to his left like tongues of fire, and his topknot is bound with a coiling serpent and crowned with a golden half-vajra. He leans towards the right in pratyalidha posture, with his two right legs bent and his two left legs extended, and his four feet pressing down upon his sun and moon disc. His sun disc is decorated with large golden roundels containing multi-petal flowers, with the sun disc resting upon a white moon disc and a lotus-seat with double petals. Crushed beneath his feet and lotus-seat are two raging bulls, both of which wear bone-bead loops on their backs. The red-black bull under his right feet tramples upon the back of a black male Rudra, and the blue-black bull under his left feet tramples upon the breast of a red female Rudrani. All the components of his sun-moon, lotus and corpse seat appear upon the great triangular vajra-rock formation beneath him. Krishna Yamari’s blood-red inner aura is encircled by a blazing mass of awareness fire, and amidst the flames and clouds above his head is a fierce black Garuda, who holds and devours a long serpent with his two hands and sharp beak. Krishna Yamari’s powerful blue-black body is adorned with the bone-bead ornaments of bracelets, armlets and anklets; short bone-bead necklaces with hanging loops and pendants, and the breast ornament of a bone wheel that loops around his upper and lower body. He wears a neck choker of small dry white skulls; a long serpent twists around his torso and left shoulder as a sacred thread; and writhing serpent ornaments coil around his wrists and ankles. Around his neck hangs a long garland of fifty-one freshly severed heads that are strung on a twisted cord of human intestines. A freshly flayed tiger-skin serves as his loincloth, with the tiger’s head resting over his right thighs, and it’s paws hanging at his sides and front. The tiger-skin is fastened as a belt around his waist by a serpent, with an embroidered green silk scarf knotted at the front of his belt. He wears the freshly flayed skin of an elephant behind his back like a cloak, with its front legs and head hanging over his right arms and side, and its two rear legs and tail hanging over his left arms and side. The yellow flayed skin of a human enemy is loosely tied around his waist, with its upturned head at his right side and its hands and feet twisting and billowing at the skin’s extremities. With his first right hand (top) he holds a sharp eight-pointed iron weapon-wheel or chakra, with the raised tip of his index finger penetrating the wheel’s central aperture in the threatening tarjani gesture. With his second right hand (middle) he wields a sharp double-edged iron sword with a golden handle. And with his third right hand (bottom) he holds a wrathful five-pointed golden vajra with open prongs. With his first left hand (top) he makes the threatening tarjani gesture while holding the long shaft of an iron vajra-hook or goad. With his second left hand (middle) he holds a bulbous wooden pestle. And with his third left hand (bottom) he makes the threatening tarjani gesture with his raised index finger, around which coils a blazing mass of fire. Four wrathful attendant deities surround Krishna Yamari to his front, right, rear, and left sides. Three of these attendants are male, and one is female. Each deity has three round red eyes, four sharp fangs, upward-streaming facial hair, and each abides in a blazing mass of fire. In the bottom left corner is a fierce blue-black deity who stands on a black bull, wearing an elephant hide, a human-skin, a tiger-skin, and an ornate metal choker or collar. In his right hand he holds the four-tiered form of Mt. Meru, and with his left hand he wields aloft a vajra-axe. At the mid-left is a wrathful red-black or maroon deity who similarly wears an elephant hide, a human-skin, and a tiger-skin. With his right hand he wields aloft a wave-bladed copper knife, while with his left hand he devours the heart of an enemy. At the mid-right is a fierce maroon mamo goddess with sagging breasts, who wears a leopard-skin loincloth. With her right hand she wields aloft a vajra-marked iron hook, and with her left hand she holds a skull-cup full of blood. In the bottom right corner is a fierce maroon snake-haired deity who wears a tiger-skin loincloth and the flayed scale-like skin of a mythical creature. With his right hand he holds aloft a jewel-topped red sandalwood club, and with his left hand he holds a rope noose or snare. At the bottom centre of this composition is an offering table or altar with a flayed yellow human-skin valance, with its upturned and scalp to the front. The central offering is an upturned skull with hanging eyeballs, which contains the main deity torma with it crowning black silk, skull and trident emblem. On either side of this central skull are skull-cups containing nectar and blood. Another five skull-cups stand on the altar, which contain nectar, blood, a flame, the five sense organs, and the auxiliary tormas. At the bottom centre is a small charnel ground scene, with deer, vultures, a raven-headed demon, and a seated Mahasiddha with a khatvanga and rosary, who gazes up at Krishna Yamari. At the top centre are the ‘Lords of the Three Families’, with yellow Manjushri at the centre, white Avalokiteshvara to the left, and blue Vajrapani to the right. The four lineage masters across from left to right in the top left corner are: Terton Gya Shang Drom; Namkhai Nyingpo; Shantigarbha, and Garab Dorje. In the second row below are: Vasudhara; Tsuglag Palge, and Rinchen Phuntsog (1509-1557). In the third row are: Je Tashi Phuntsog (1574-1628), and Panchen Konchog Lhundrup. And at the bottom is: Konchog Tashi Dondrup Chokyi Gyalpo (1704-1754). The four lineage masters across from right to left in the top right corner are: Jampal Shenyen (Manjushrimitra); Yeshe Nyingpo; Drag Tung Nagpo, and Terton Lhaje Nub Gyu. In the second row below are: Rigdzin Chokyi Drag; Padmasambhava, and Nub Sanggye Yeshe. In the third row are: Chogyal Phuntsog (1547-1602), and Konchog Zangpo (1656-1718). And at the bottom is: Konchog Tenzin Drodul (1724-1776).